Massachusetts is trying to solve an economic puzzle. Unemployment is low and the economy is humming along, but tax revenues are sluggish and lawmakers are struggling to balance the state budget. In another recent boom during the late 1990s, the state's economy was also buzzing. But back then, the boom was felt on Beacon Hill, too, which found state coffers flush with cash. Taxes were trimmed as officials strived to shed its "Taxachusetts" nickname that was scaring many businesses away. Now? Revenues can't seem to keep pace with spending, leading to chronic shortfalls in a $40 billion budget that the state's constitution requires to be balanced. There's plenty of disagreement over whether the state needs to raise taxes, or tighten its belt and cut spending. But nearly all agree there's a problem. In March, state tax collections fell about $81 million, or 3.4 percent, below projections for the month, and it wasn't just a blip. Overall, tax revenues are $220 million - or 1.2 percent - below benchmark with just three months left in the current fiscal year. 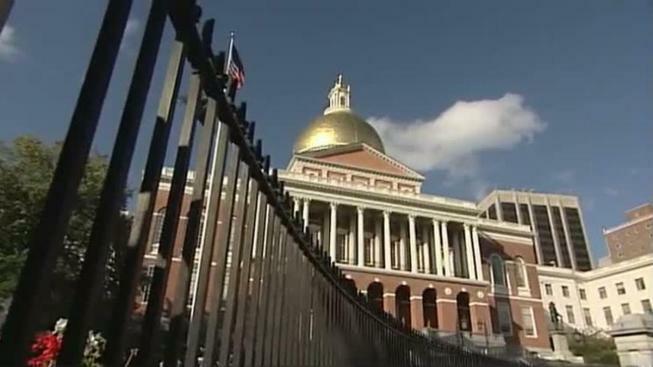 Democratic Senate President Stan Rosenberg says it's been years since Massachusetts could balance its budget without resorting to what he called "gimmicks" and "Band-Aids." A big part of the problem, according to Rosenberg and others, is that Massachusetts is trying to apply a 20th century tax code to a 21st century economy - an economy based increasingly on internet sales and services and less on struggling brick-and-mortar stores. Rosenberg told reporters this week that while there's no outcry for a new sales tax on services, that discussion should be in the mix. "The service area is very wide and deep and so it doesn't mean that just because you're talking about a service tax that you're looking at taxing everything under the sun," he said. "But a service tax is in place in a substantial number of states and we ought to take a look at it and see if it works for us." Democratic leaders in the House are more reluctant to raise taxes. They released a budget plan this past week with no broad-based tax hikes and even passed on a proposal by Republican Gov. Charlie Baker to apply the state's hotel tax to online lodging services such as Airbnb. House Ways and Means Committee chairman Brian Dempsey noted that while the Legislature backed modest tax increases in 2011 and again in 2013, "It's never easy to get a package through." Dempsey, a Haverhill Democrat, said the House would take a wait-and-see approach as the budget winds its way through the legislative process. Baker's stance against any broad-based tax increases also remains unchanged. Some Democrats are pinning their hopes on a so-called "millionaire tax" ballot question that could go before Massachusetts voters next year and, if passed, generate nearly $2 billion for transportation and education. Under the proposal, individuals with annual incomes above $1 million would be subject to 4 percent surtax on any income over $1 million. Noah Berger, president of the independent Massachusetts Budget and Policy Center, said there are no simple solutions. He said taxing services may sound like one option, but one of the largest providers of services is the health care sector, and there would likely be little political appetite for taxing health services. He backs the millionaire tax but doesn't think it would fully solve a problem that has been developing over two," Berger said. Jim Stergios, executive director of the conservative-leaning Pioneer Institute, said the problem isn't how much revenue the state is collecting, but how much it's spending. He said since 2000, growth in the state budget has outpaced household income growth. Take the state's Medicaid budget, which has doubled in the past decade and consumes more than 40 percent of the entire state budget. "The state has blown a gasket on health care spending," he said.